Whether you are looking for specifics about a building's daily schedule, start and dismissal times, or a broad overview of the calendar year, complete details are available here. 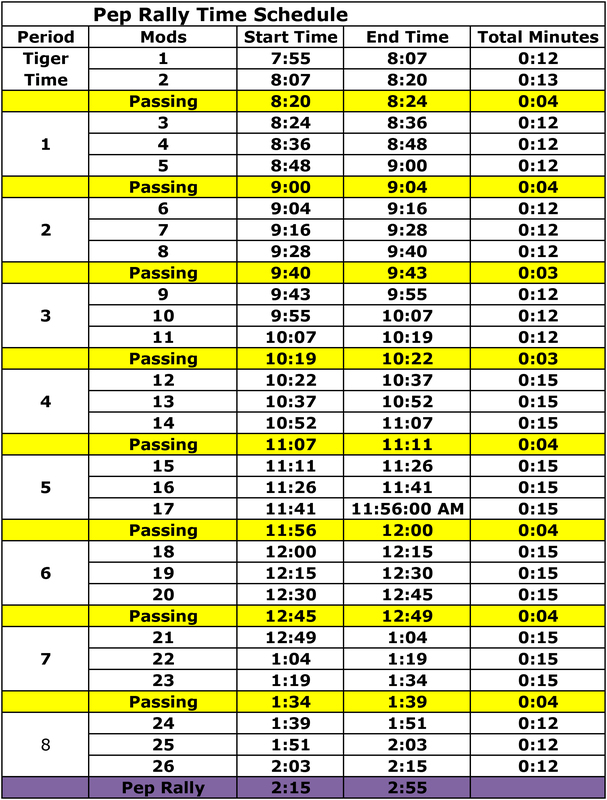 This includes the standard daily schedule, as well as the schedule for days with a 2-hour delay. 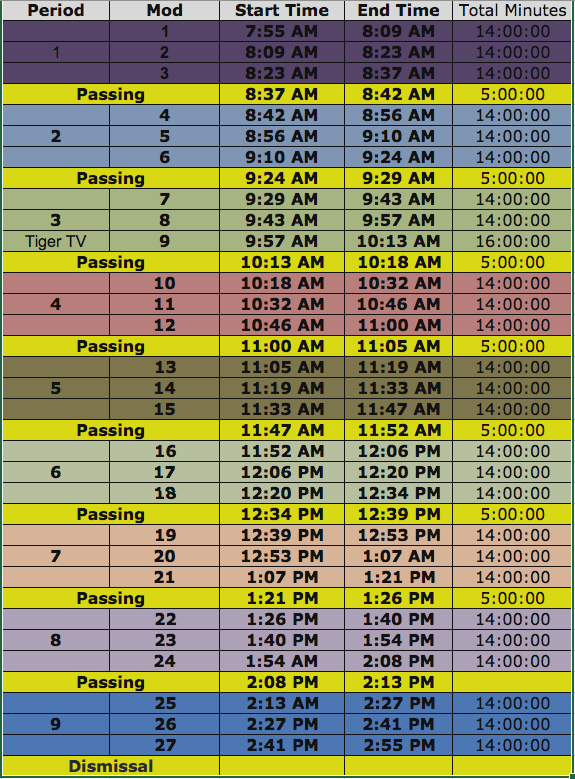 Junior high and high school bell schedules are also provided. The Board of Education approved the 2018-19 school year calendar at its Feb. 12, 2018, meeting. (Download calendar as PDF) Please note that Pickerington Schools will make up one snow day on Feb. 18, 2019. Parents are encouraged to refer to this calendar when planning activities such as vacations, family trips, and doctor’s visits. The first day of school for grades 1-12 will be Wednesday, Aug. 15, and the last day for grades K-11 is scheduled for May 24, 2019. Winter break for students will begin on December 21 and classes will resume on January 7, 2019. Spring break is scheduled for March 18-22, 2019. If the district has a calamity/snow day before Presidents Day on February 18, 2019, the district will use that date as the make-up. The following 2-4 calamity days will be made up with student “blizzard bags.” For information on blizzard bags visit the calamity day page. The Board of Education approved the 2019-20 school year calendar at its Dec. 10, 2018, meeting. The first day of school for grades 1-12 will be Thursday, Aug. 15, and the last day for grades K-11 is scheduled for May 22, 2020. Winter break for students will begin on December 23 and classes will resume on January 6, 2020. Spring break is scheduled for March 23-27, 2020. If the district has a calamity/snow day before Presidents Day on February 17, 2020, the district will use that date as the make-up. The following 2-4 calamity days will be made up with student “blizzard bags.” For information on blizzard bags visit the calamity day page. Standard District Office hours are 8 a.m. to 4:30 p.m. weekdays. Summer office hours are 7:30 a.m. to 3:30 p.m. starting soon after Memorial Day. Normal hours resume in early August. 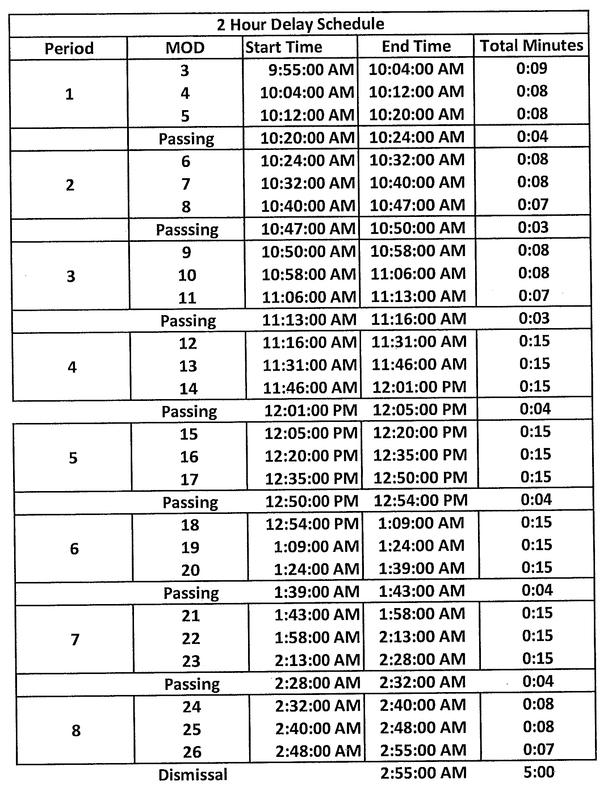 Note: High School scheduling is based on 26 15-minute daily mods, allowing for flexibility in scheduling and course design.